OSHA hearting tests and government regulations for employers subjecting employees to excessive nose levels. The OSHA regulations regarding the testing of employees who are exposed to excessive noise levels are outlined below. What OSHA defines as excessive noise .. and how much can your hearing handle? A simple definition of noise is "loud unwanted sound". What is noise to one person may be entertainment to another. From a legal standpoint the definition of noise is different. Legally noise is exposure to sounds exceeding an average of 90 dB of noise for eight hours per day. A TWA (time weighted average) of 90 dB equals the current maximum legal noise exposure. The exposure level is currently being reviewed and NIOSH is recommending that the TWA is reduced to 85 dB for all workers. The decibel scale is a logarithmic scale, which means that the scale is not linear, and we really have a hard time relating to the numbers. Every three dB represents a doubling of the sound level, and every 10 dB represents a tenfold increase in sound intensity. Add two machines making 90 dB each, and the result is 93 dB. Noise erodes the small hair cells inside the cochlea of the human hearing organ. It is a very gradual process, and not a very noticeable one in the early stages. The damage that occurs on a daily basis is at first a temporary hearing damage. With repeated noise exposure the temporary damage turns into a permanent damage. At this stage the damage is irreversible. How can you prevent this from happening to you or your employees? Noise control measures should come first. Eliminate or reduce the noise whenever possible. When all measures have been taken to improve the environment, hearing protection must be used if noise still exceeds the action level. An average hearing protector has the attenuation of 20 to 29 dB. Considering that every 3 dB cuts the noise in half, you can get a lot of protection from an ear muff or ear plug. But hearing protection has to be used correctly or they will lose a great proportion of their effectiveness. The above summary of OSHAs hearing conservation requirements is not intended to be complete. The complete regulation (29CFR-1910.95) is available on the internet. The Occupational Safety and Health Administration issued a final rule on July 1, 2002, that revises the criteria for recording work-related hearing loss. Beginning Jan. 1, 2003, employers will be required to record work-related hearing loss cases when an employee's hearing test shows a marked decrease in overall hearing. Employers can make adjustments for hearing loss caused by aging, seek the advice of a physician or licensed health care professional to determine if the loss is work-related, and perform additional hearing tests to verify the persistence of the hearing loss. "Hearing loss can result in a serious disability and put employees at risk of being injured on the job," said OSHA Administrator John Henshaw. "This approach will help employers better protect their workers and help all of us improve our national injury and illness statistics and prevent future hearing loss among our nation's workers." Under the new rule, the criteria will record 10-decibel shifts from the employee's initial hearing test when they also result in an overall hearing level of 25 decibels. The old criteria recorded 25-decibel shifts. The agency is also seeking public comments on a proposed one-year delay of the recordkeeping rule's definition of musculoskeletal disorders (MSDs), and whether to include MSDs and hearing loss columns on the OSHA Form 300 Log of Occupational Injuries and Illnesses. Written comments on the agency's proposal to delay the recordkeeping rule's definition of "musculoskeletal disorders (MSDs), and whether to include MSDs and hearing loss columns on recordkeeping forms, had to be submitted by August 30, 2002, in triplicate to the Docket Office, Docket R-02B, Room N2625, Occupational Safety and Health Administration, U.S. Department of Labor, 200 Constitution Ave. NW, Washington, DC, 20210, (202) 693-2350. The final rule on the criteria for recording work related hearing loss and the notice soliciting comment on the definition of MSDs and columns for MSDs and hearing loss was scheduled to appear in the July 1, 2002 Federal Register (2): [67:44037-44048 - Final Rule] Detailed information on the Agency's recordkeeping requirements is available on OSHA's web site. Industrial Paramedical Services has been providing complete Multi-Phasic Mobile health testing services to over 800 Midwestern plant facilities since 1975. 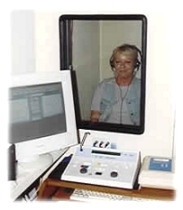 We specialize in providing on site hearing tests for your employees with our unique copyright protected audiogram records. Our clients include major manufacturers in the automotive, utilities, construction, petroleum, aero-space, airport workers and metal fabricating fields. Our visual presentation audiometric 8 year record chart transcends language barriers and reinforces a real "fear of hearing loss" that motivates the employee to self-enforce the proper use of wearing hearing protection. Early detection of hearing loss can alert both parties to the need for improving hearing protection, such as combining ear plugs with ear muffs. IPS also can furnish your company with easy to comprehend literature and videos as part of a complete health and safety education program.Call us at (800) 231-1006 for a free quotation on our Mobile Health Testing Services.